This porch is a favorite of ours and we've seen many over the past 10 years. This is our 100th newsletter issue and we're so grateful for you, our fellow porch friend. 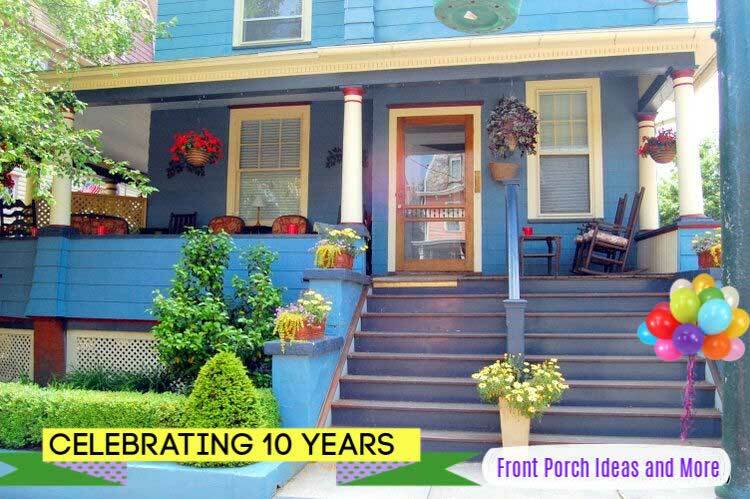 Ten years ago when Dave and I came up with the idea for our site, would you believe we didn't have a porch nor a single photo of a porch? 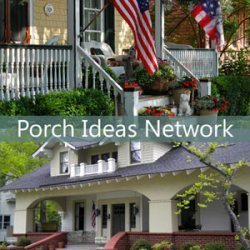 All we had was wonderful memories of growing up with porches, a great worth ethic and visions of ways we could share porch ideas with you. Back then in early 2009, there wasn't much on the internet about porches. We started with a few photos we purchased, an outline of topics we wanted to share with you and many hours of burning the proverbial midnight oil. Dave brought to the table years of beautiful woodworking experience and a natural instinct for knowing how to visualize designs and fix problems around our home. I came with a creative heart and the label that Dave gave me, his "IT guy". 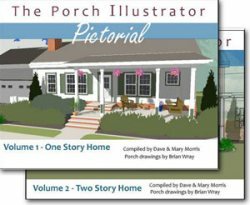 Together we've traveled many miles throughout the states, photographing porches of many types of architecture, meeting fellow porch lovers and creating a business that has enabled us a great deal of flexibility. Our site wouldn't be anything without you! We are very appreciative of your participation - from sharing pictures and porch ideas, to asking thoughful questions and sending good thoughts our way. We sure enjoy hearing from you. And what we've learned is that some of you live vicariously through us because your home doesn't have a porch. No worries, we haven't always had the luxury of having a porch. And some of your have amazing porches. 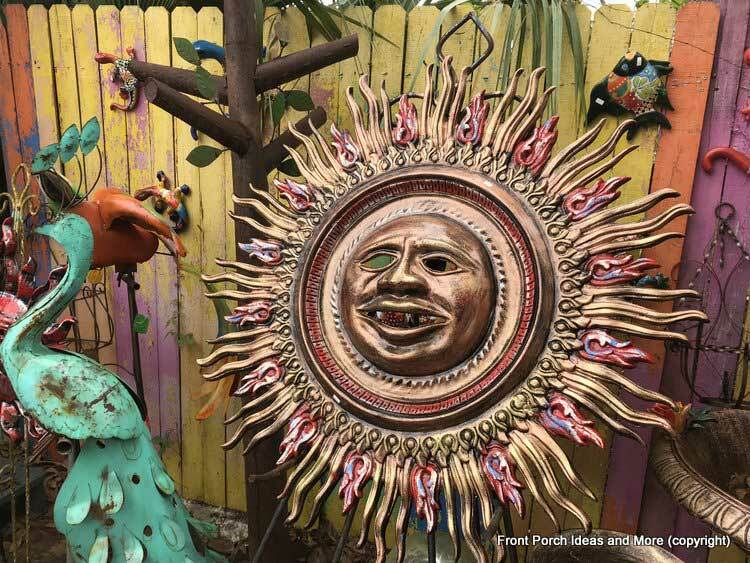 No matter which end of the spectrum you are on, we warmly welcome you here for friendly porch talk and sharing of ideas. We are looking ahead to the next ten years and what's in store here. God willing, we'll continue to share our passion with you a good ten more years. Thank you a million times over for visiting us here, on our Facebook page, youtube channel and pinterest boards. 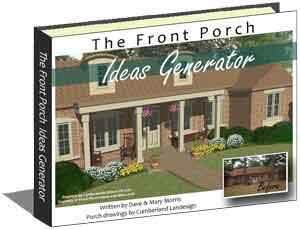 We're aptly called Front Porch Ideas everywhere. And yes, we do have a porch now that we enjoy and decorate. A back porch too. We truly feel "porchunate"! We wouldn't have it any other way. Ever Consider a Rolling Gate? What are you seeing bloom in your area? Whether you live in mild California, sunny Florida or still have snow in your driveway and cold winds blowing, spring is a welcome season to just about everyone. There's a universal love of seeing the first tiny blooms in spring. As they say, hope springs eternal. We have several hyacinths in full bloom in our backyard and see spring green leaves popping out on trees around us. So whether you're in full springtime mode, like we recently experienced in Florida, or still shoveling snow and enjoying the warmth of your fireplace, just know that spring comes on its own time. But it will come. Dave and I embrace these last cool days of the season because soon it will be very warm and humid in Nashville. So don't call us out on it, but we both like, especially me, the cooler months of winter. But for sure, living in Nashville isn't like having a winter up north where you may live. 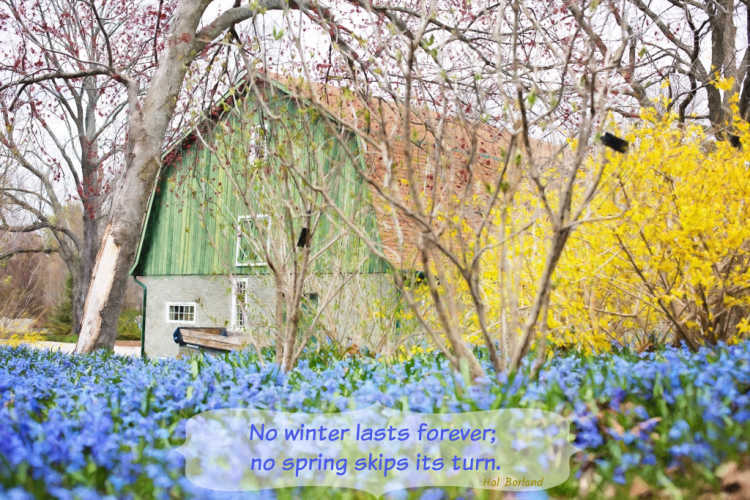 We like this saying by Hal Borland: "No winter lasts forever; no spring skips its turn." Isn't that the truth about so many things? May it come in handy next time you feel blue. Dave and I visited Florida in the past couple of weeks for time with family and on our trip we had the wonderful opportunity to visit St. Augustine, Florida What a wonderful, historic town. Did you know it's the oldest city in the US? Founded in 1565 - over 450 years old. The two of us are not your typical sight-seeing visitors. 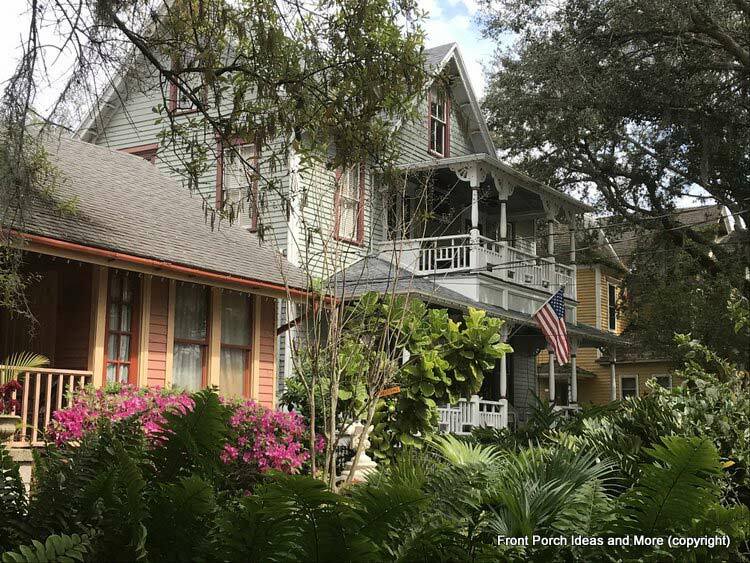 Rather than taking in shops and tourist sights, we enjoy time looking at porches in the neighborhoods. 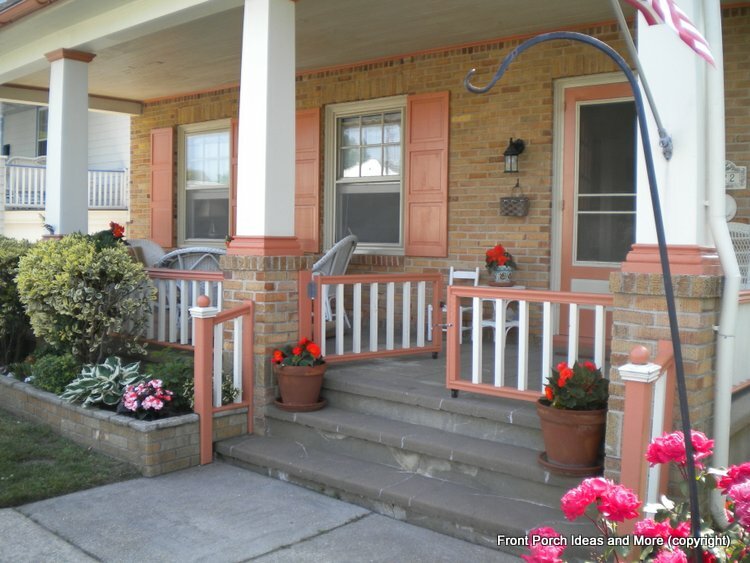 You can easily tell the residents here embrace their porch time as porches were adorned with rocking chairs, flower pots and seasonal decor. Please take an hurried moment to visit our new St Augustine Fl page. 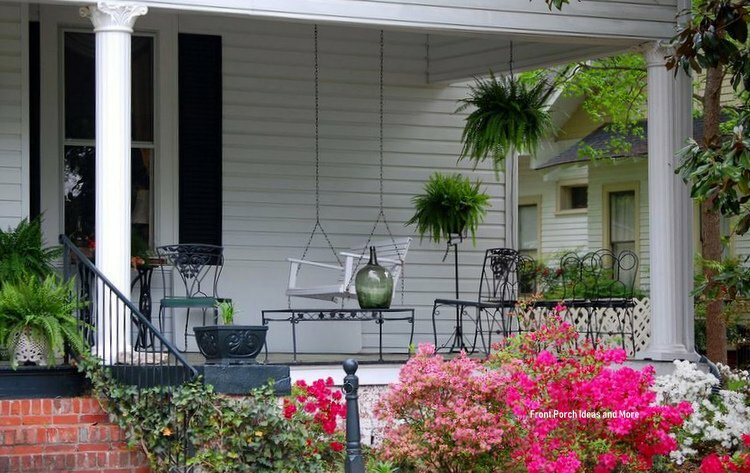 Ever Consider a Rolling Gate for Your Porch? If you have small children you are trying to keep a bit safer or you simply want more privacy on your porch, a rolling gate may be the answer. Our son put one on his porch when his children were very young - and it had a child-proof latch as well. The porch shown here is a wonderful example of how attractive a rolling gate can look. 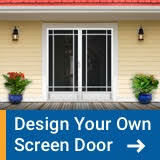 Here's a bit more about porch gate ideas for you to explore. 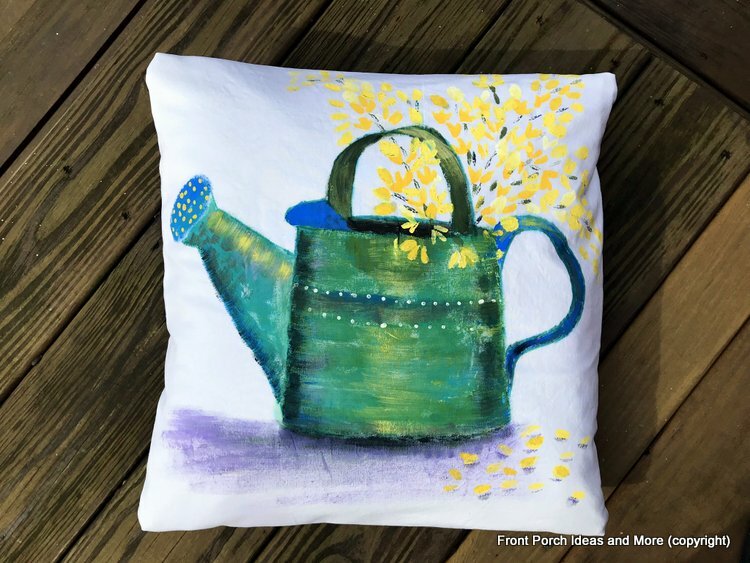 We are getting ready for our spring porch! We'll have fun with sprinkling cans this year. 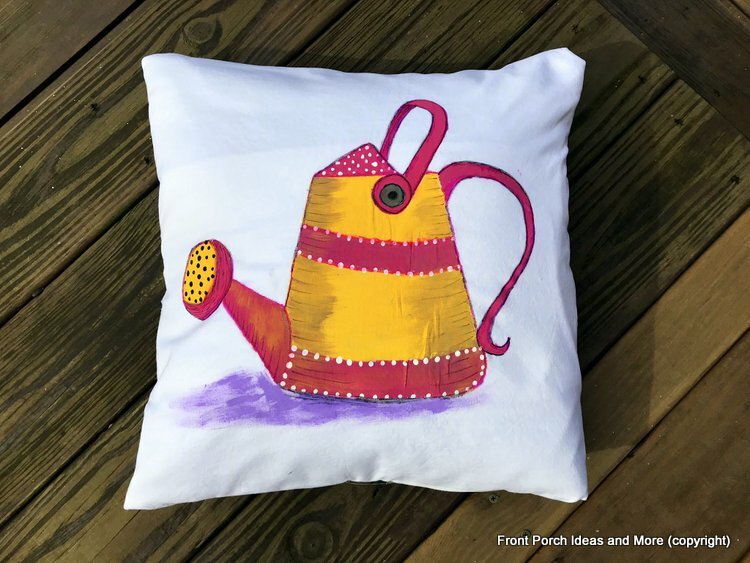 Mary painted these pillow toppers and more are on the way. 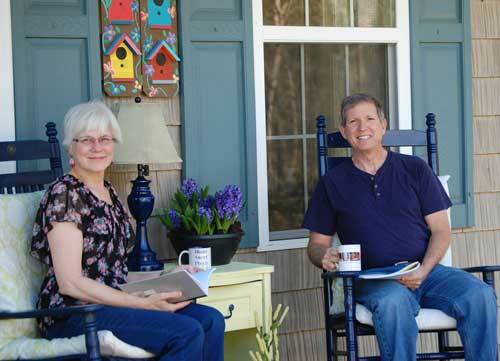 In the next edition of our newsletter, we'll show you our spring porch. This is just the start. 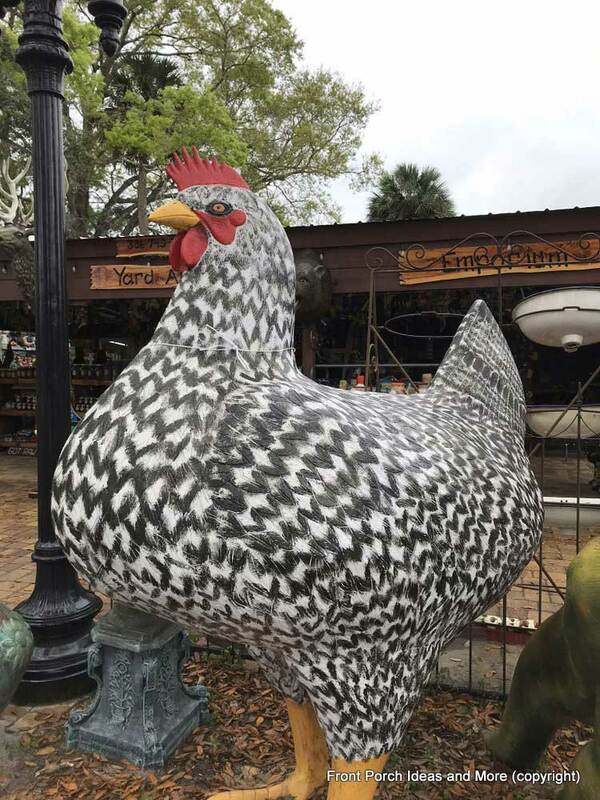 Yard Art Emporium - Quite a Fun Place! 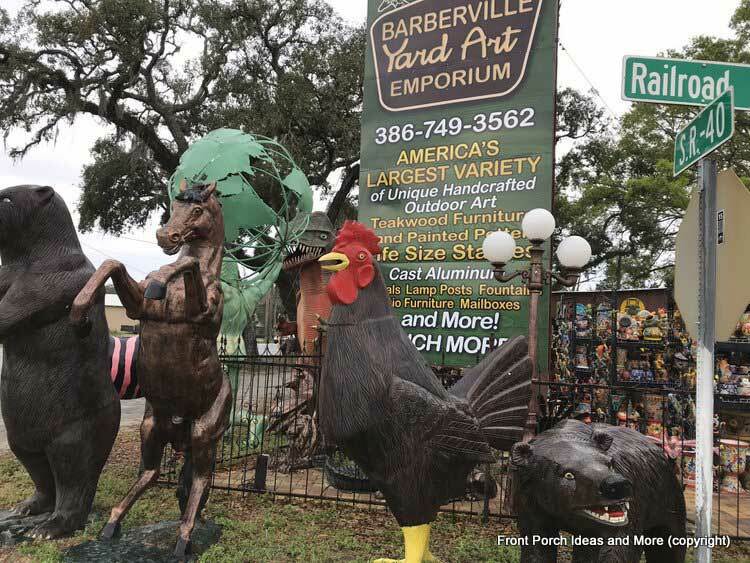 Barberville Yard Art Emporium, in Pierson Florida, is home to more yard art than you can possibly imagine. On a recent family trip to Florida, Dave and I came across this wildly colorful place at the intersection of route 17 and highway 40. You simply cannot miss it. 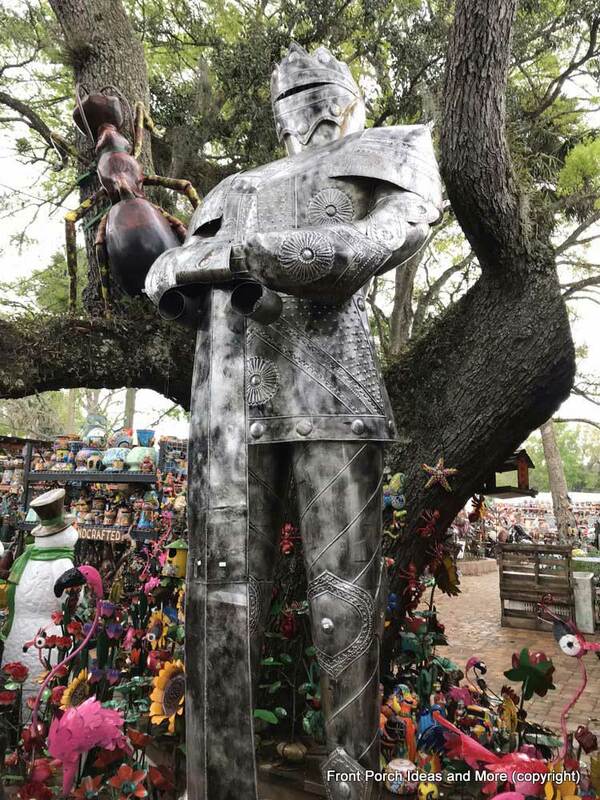 For colorful, larger-than-life characters, plentiful assortments of just about anything you can imagine for your yard. 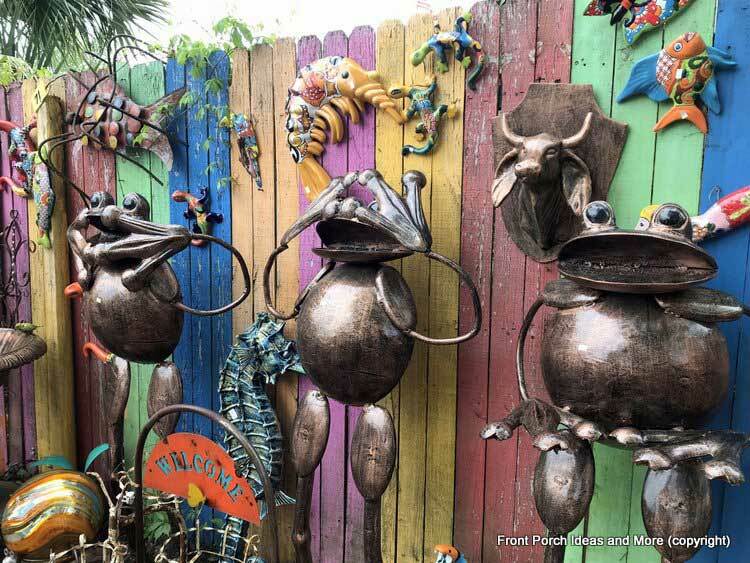 Furniture, teakwood, recycled cast aluminum, colorful pottery and a large collection of ceramic figures. 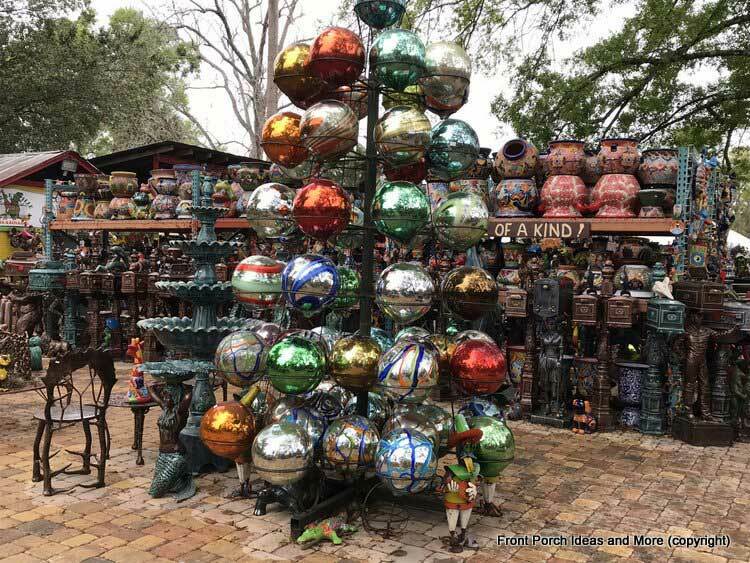 We had fun just walking around this enorous emporium of everything-yard-art! Gazing balls galore! This is just a sampling. Believe us. 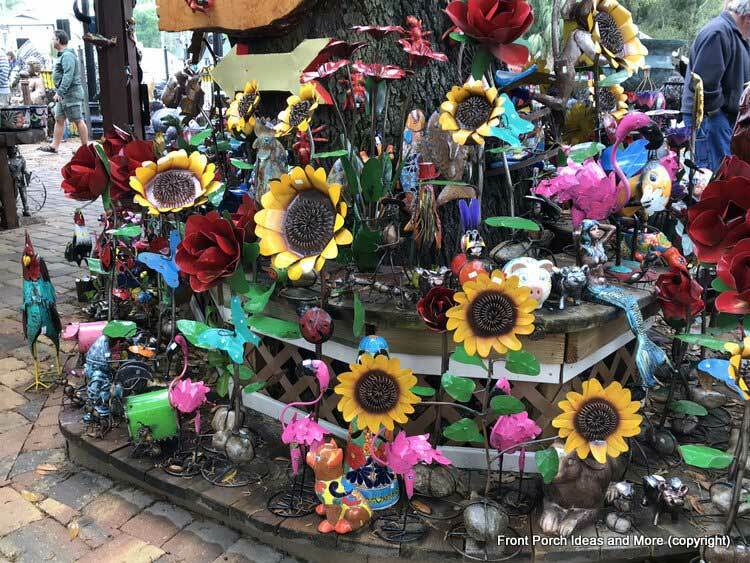 Want yard art flowers for your yard? You can surely find them here. 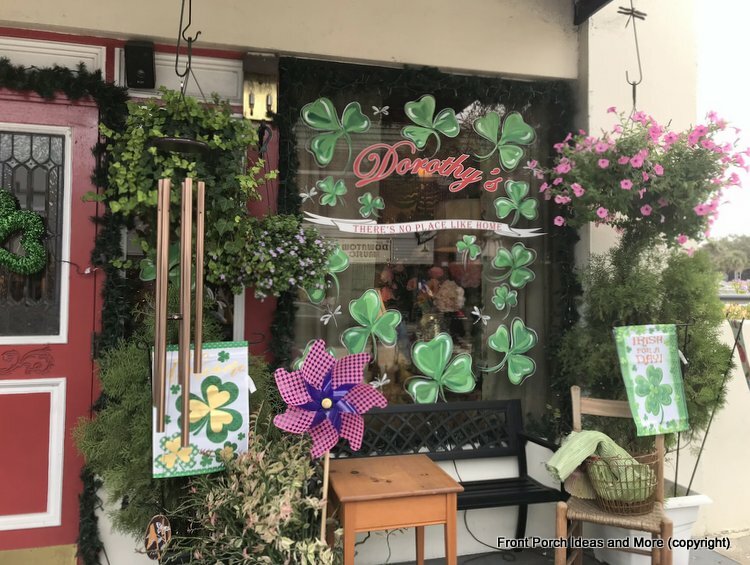 While visiting Deland, Florida recently, Dave and I passed this pretty flower shop all decorated for St. Patrick's Day. 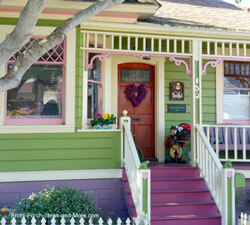 We were pleasantly surprised at how many homeowners decorated their porches with shamrocks and pretty green decor. 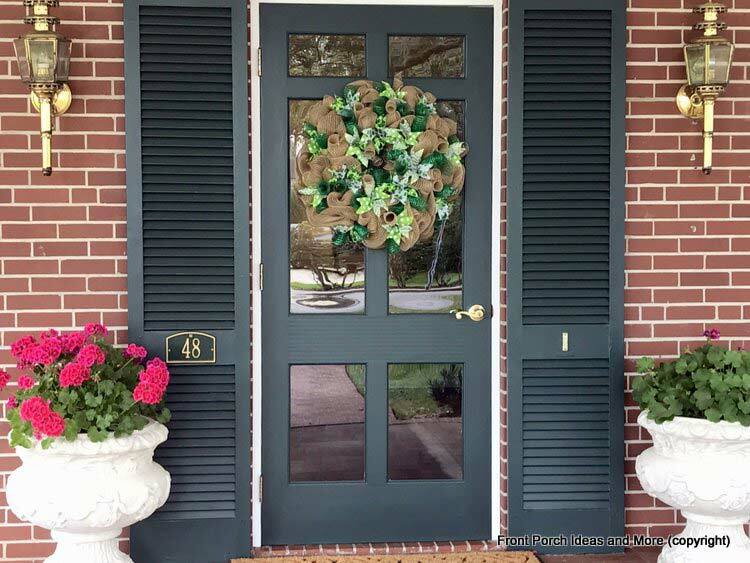 This homeowner had a most wonderful wreath on display for St. Patrick's Day. Isn't it wonderful how a few elements can make for a beautiful entrance way? Catch all of our inspiration for St. Patrick's Day here. 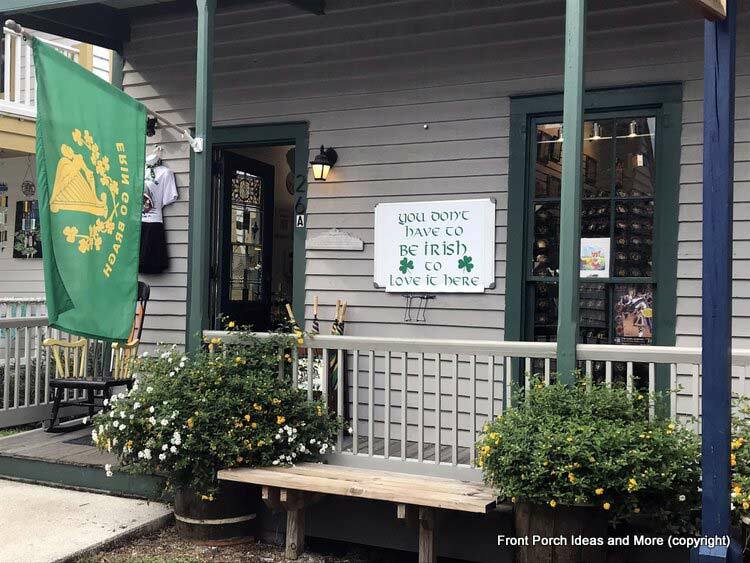 We love their sign, "You don't have to be Irish to love it here." Recent outbreaks of fierce storms rightly cause those in tornado zones to take extra precautions. For maximum protection, a tornado shelter can help keep you and your family safe. Not only do you have to consider cost but also what type of shelter is suitable for your specific needs. Mary and I discovered this practical storm shelter idea and think it might be ideal for many. 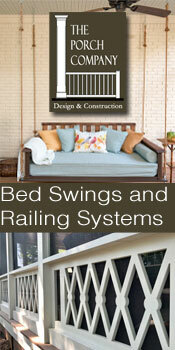 You can integrate the design into a porch, deck, patio, or three-season room making it easy to access when needed. How About a Porch That's Also a Storm Shelter? Yes, you read that right. A storm shelter that is a part of your porch or slab (or deck). Do you see the entry for the storm shelter on this porch? 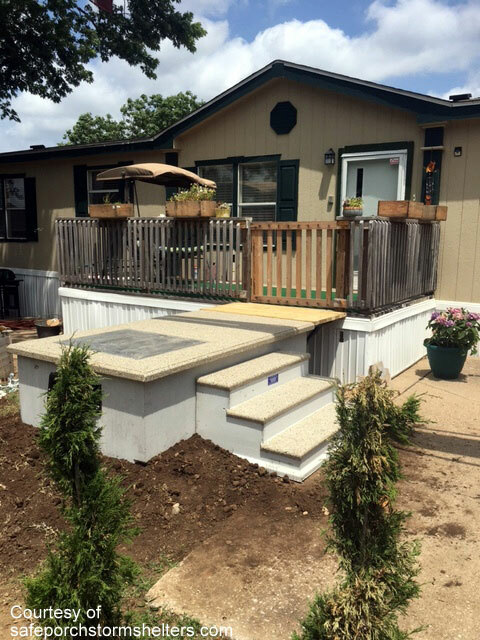 Visit our page to learn more about the SafePorch concept. Now on a slightly different note...did you know you can purchase a storm shelter for your home on Amazon? 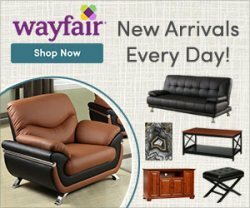 As an Amazon associate, this is our affiliate link and we may earn from it, but at the same cost to you. Even with one or two steps, someone can fall. 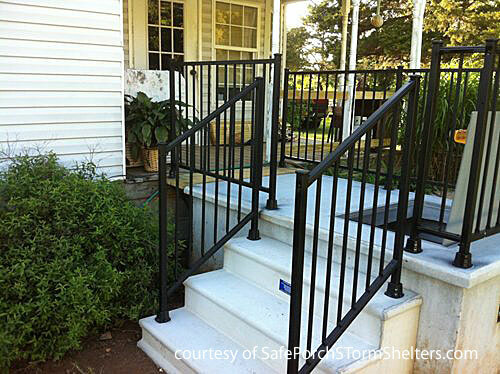 A porch handrail can make all the difference in the world. These handrails also come in the 2 or 3 step size. We're happy that quite a few of our readers have purchased these porch handrails. Really, a porch handrail can be invaluable. It's something to hold onto no matter your age. 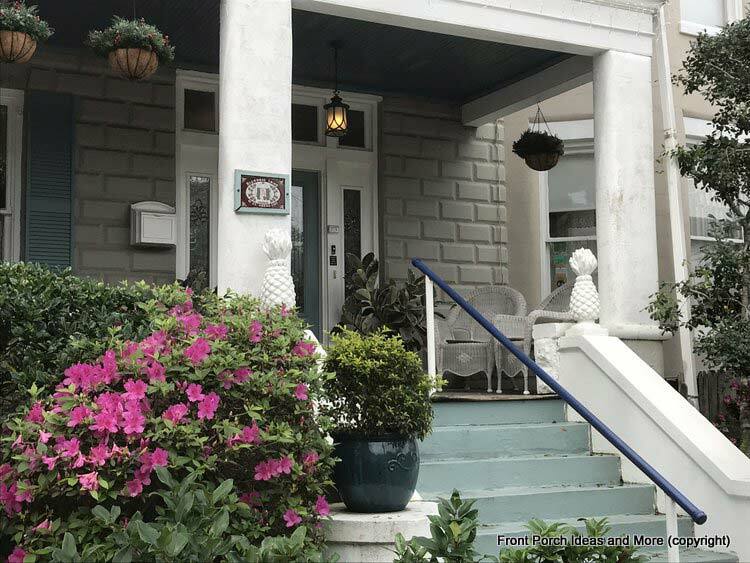 Metal handrail kits make it easy to safe-proof you porch, deck, or stoop stairs - so your porch is friendly and welcoming for climbing the stairs. And they also look curb-appealing too. 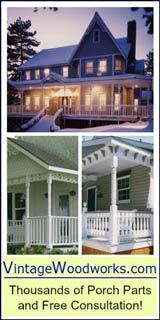 Learn more about porch handrails right here. Remember, it's the small things that get us sometimes. The March winds are the morning yawn. 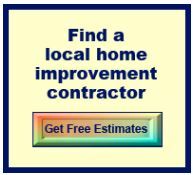 We know your life is very busy and we sure appreciate you taking the time to read our newsletter. 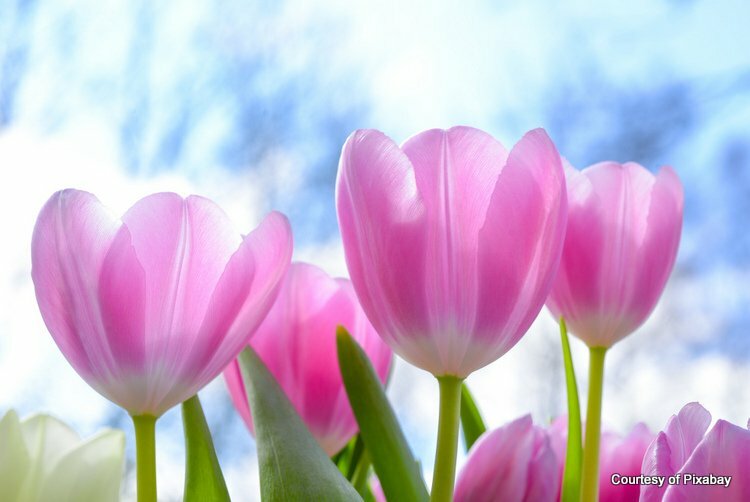 Pause your day for a moment - if you wish - to think of warm spring breezes and colorful blooms awakening. Isn't it good to relax, even if for a moment? It restores our hearts and souls and helps us move back into our day. Thank you for taking time out of your day for us. Sharing your time with us is a precious gift.